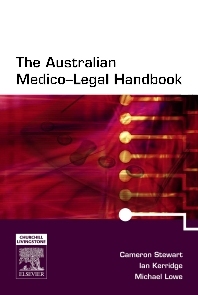 The Australian Medico-Legal Handbook will be provided with PDA software and aims to give JMOs immediate, clear and concise answers to the most frequently asked legal questions arising during hospital training. Doctors carry very little when they are in the ward but are increasingly carrying PDAs, making the accompanying software an ideal content delivery method. The handbook and accompanying PDA software is the only one of its kind offered to Australian JMOs. Content development is based around the authors' research through ongoing focus groups into the most commonly asked questions by the end user, that is, JMOs in the hospital training environment. Law updates and other relevant materials (including guidelines and links to relevant Health Department documents) will be provided on the accompanying Evolve site. Written by a proven author team, each an expert in the medico-legal and/or ethical fields.